Ok yall so Halloween is over and I am one of those people who throw themselves right into Christmas. Now now, I know “What About Thanksgiving?!?! ?” Just because I put my tree up while there is still clearance candy corn and pumpkin Reeses does not mean I skip out on Thanksgiving or love it less. Just cause I got Christmas music on and tinsel from one end of the house to the next does not mean I don’t go all out on Thanksgiving, I just prefer decorating with ornaments and sparkly lights over turkeys lol. Plus I am already ahead of the game and have given you guys some awesome Thanksgiving recipes (check out my sidebar for them). But now it is the time when I like to prepare for Christmas, plus I mean if you have a Christmas party, that’s like what a month or so away, so it’s never to early to start. Anyways, anyways Dana and I are bringing you our Christmas Series!! We will be giving you awesome recipes from appetizer, to main dish, side dish and dessert, all for your holiday enjoyment. So first up is appetizer. I love making cutsey Christmas appetizers, cheeseballs that look like snowman, love it! My turkey pinwheels that look a Christmas Tree, fa la la lawesome! 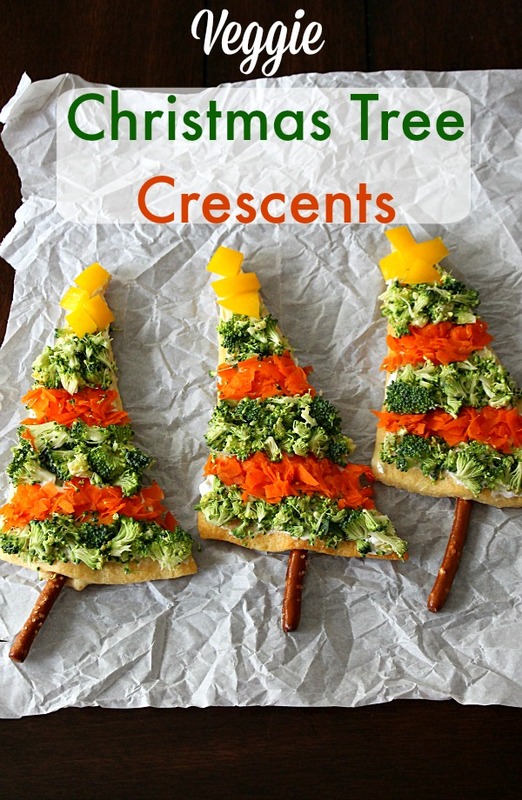 So I love using crescent roll dough for everything and for this new Christmas appetizer I pop that can again and made these yummy Veggie Christmas Tree Crescents. They are so easy to make and can be made in no time!!! 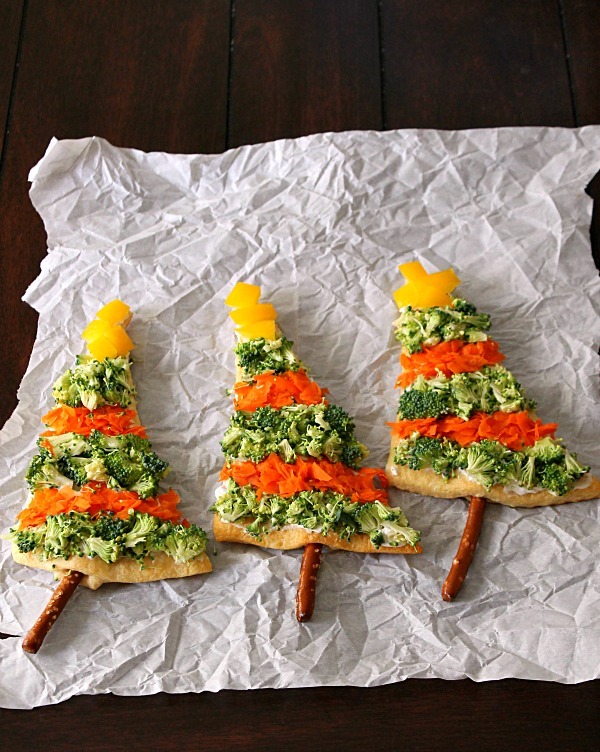 Now they look awesome and super Christmasy and you can pick them by the pretzel stick bottom, but depending on thick your spread your cream cheese or how heavy you lay on the veggie that little pretzel stick might not be able to support each tree so just be careful lol. I used chive cream cheese on mine but feel free to use plain, jalapeno, garden veggie, garlic, whatever kind your heart desires. You can also change up the veggies thought I would still always use broccoli to mimic the green of a tree. Open the can of crescent rolls and unroll them so you get the "triangles"
On a greased cookie sheet place 7 of the crescent "triangles". 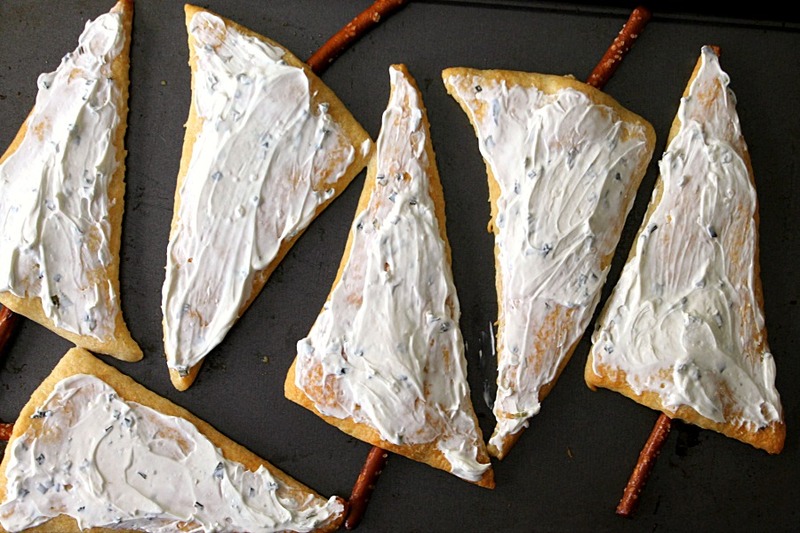 Place a pretzel stick under each triangle. Tear off little bits of the 8th crescent triangle that you didn't use and stick piece of it behind the pretzel to help it stick. Bake 10-13 minutes until golden. Meanwhile finely chop your veggies. 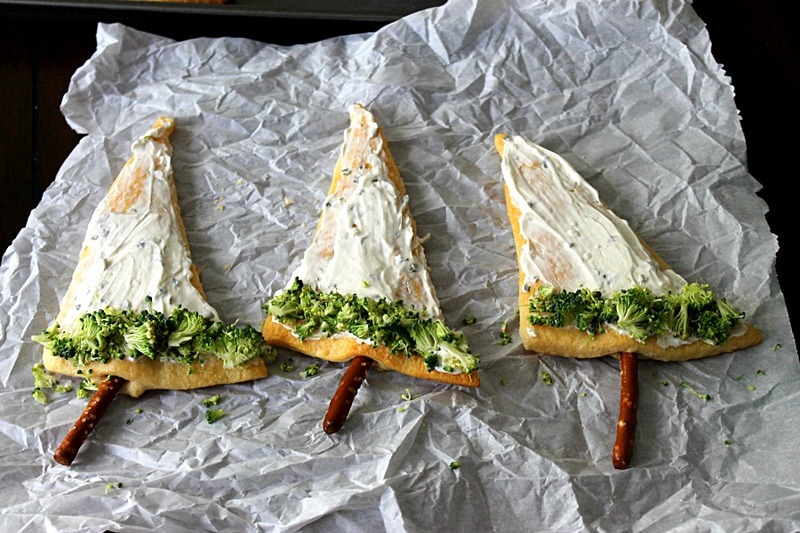 Now spread the cream cheese on the "trees". Sprinkle the veggies in an alternating pattern. Top your trees with a yellow pepper star and serve!!! These are delicious, easy to make and so festive and hope you make them for all your holiday get togethers this season!! Don’t forget to stop by Dana’s and check out her Creamy Bruschetta Bites, yum!! Follow me on Pinterest for more great ideas!! 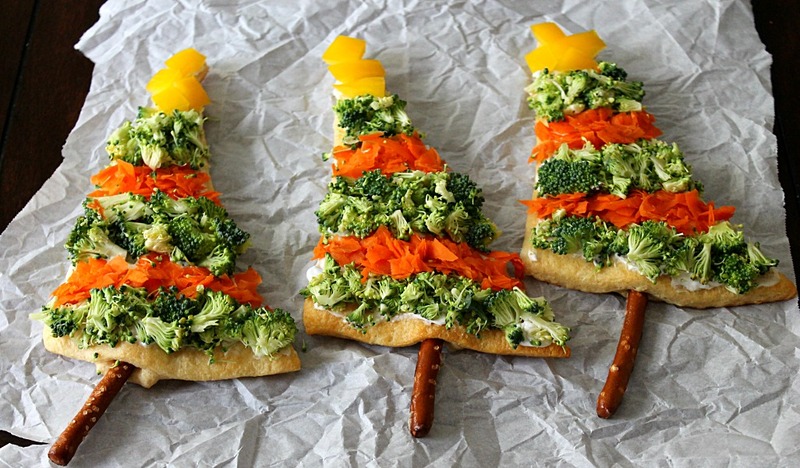 I love your Veggie Trees! They are so cute and look so so yummy! Thanks for sharing! PINNED! Hope it will get the kids to eat their veggies! Thanks for sharing it! I hope you will stop by the Found & Foraged Linky Party next week too! (Saturday @ 8PM CST) Hope to see you there http://www.thebigrevealblog.com! Fun and easy ideas for Christmas. Pinning. These are oh so adorable! LOVE OVE LOVE! These look scrumptious! 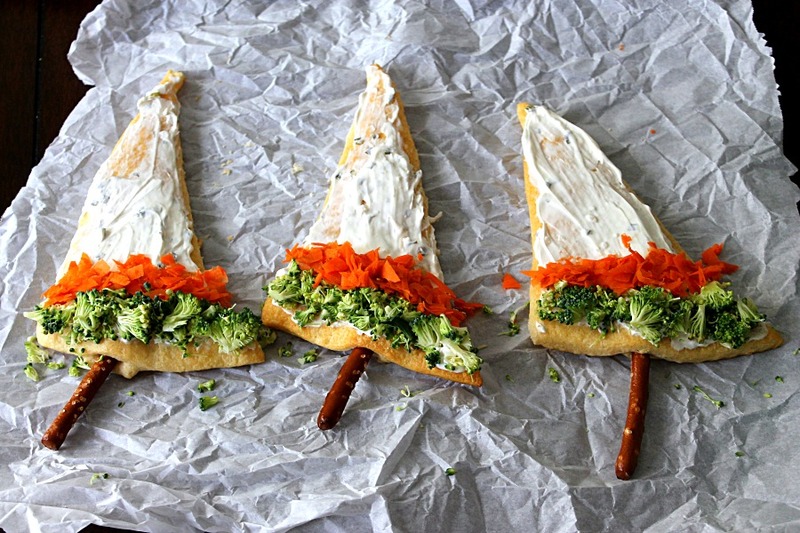 They are adorable too… the perfect little appetizer for a Christmas party. I’d love for you to share these at my Creative Ways Link Party that just went live. Hope to see you there! I think I could personally eat a million of these crescents! Just maybe my kids will try them too, and get some veggie goodness. I love that you decorate for Christmas already. This was the first year I did before Thanksgiving, and I”m honestly loving it. Thanks for sharing on Weekend bites! How cute! I love veggie recipes. I would love for you to link up over at Scraptastic Saturdays. I pin all projects and share via Facebook and Twitter. Hope you have the chance to drop by. Have a wonderful week. 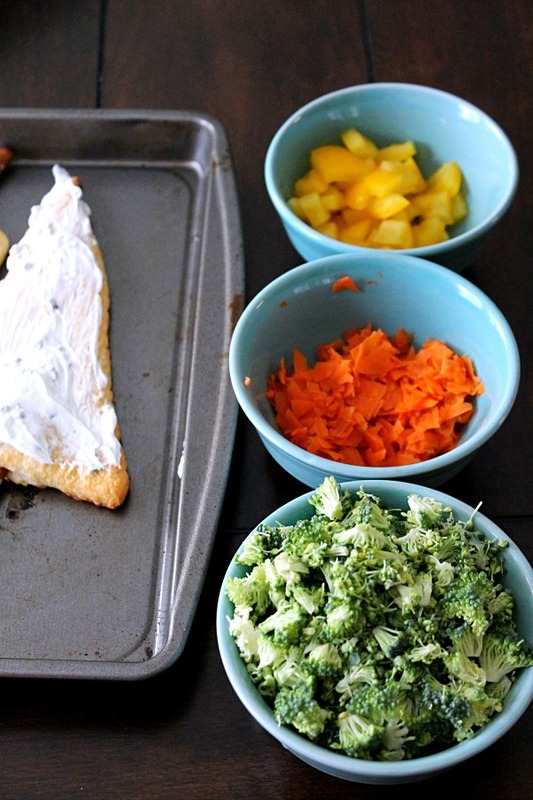 I am definitely making your veggie crescent roll christmas trees for my daughter’s preschool snack day this December! Too cute! She is not a fan of peppers, yellow or any other color, so I think I will cut a bit of yellow cheese into the shape of a star for the top of the “tree”. I can’t wait to make these with her! Thanks for the inspiration! I am so excited to find a festive recipe she can help me make and be proud to take to school!